blueberry honey yoghurt cake with gooey, puddingy insides and a thick chewy bread-like crust. This is what happens when you're feeling a little bit peckish on a Friday night and decide to just throw some ingredients together to see what happens. You're skeptical about the results, as it wasn't quite what you expected - but it grows on you, and the boyfriend comes back for seconds. So, somehow, you find yourself making it again on Saturday morning. It's all about flour and yoghurt and honey and blueberries... coming together mysteriously to create this strangely quite delicious concoction. 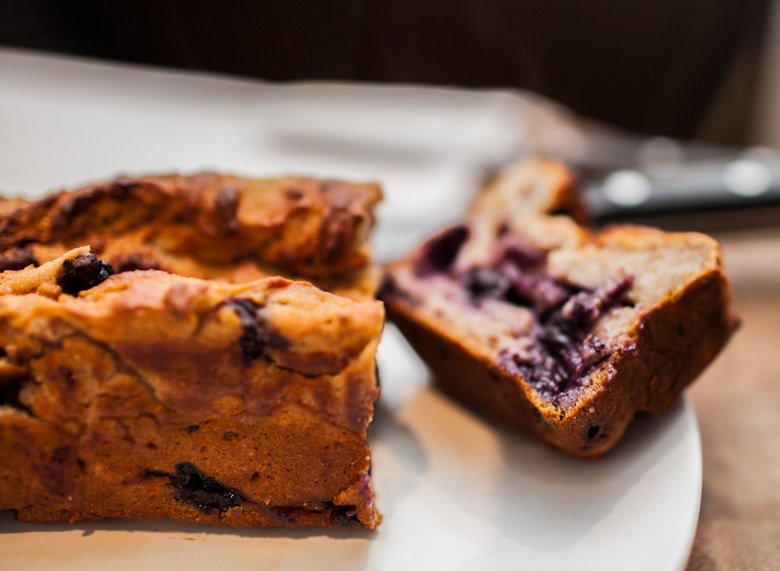 soft and gooey blueberry yoghurt honey cake. Crazy soft, moist, spongy insides are held together - just - with a bread-like frame. This pudding-cake is best served while it's still snuggly-warm from the oven. Due to its unique texture, it's easiest to treat it like bread - just slice it with a serrated knife, then simply take it by the hand. If you're feeling extra decadent, though, you might pair it with a scoop of ice cream, and drizzle all over with, say, honey, maple syrup, caramel or butterscotch sauce. P.S. I'm not sure I'm convinced by the chewy crust - I think I would probably prefer it crisp. 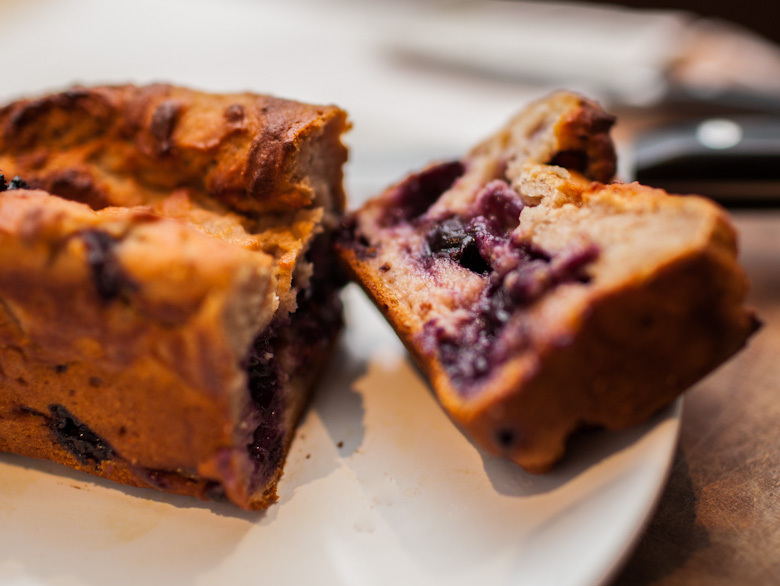 But it seems to be a natural side effect that comes with the comfortingly gooey filling, so we'll roll with it! P.P.S. Apologies for the depth of field in these photos, which doesn't capture the texture of the cake as well as I'd like. I was experimenting with Simon's DSLR camera, and clearly not very good at using it yet! chewy, gooey cake with vanilla ice cream. Preheat oven to 180°C/350°F fan-forced or 200°C/390°F conventional. Mix wholemeal flour, baking powder and salt in a bowl, and make a well in the middle. In another bowl, dissolve honey in water. Stir in yoghurt, then the blueberries. Pour the liquid mixture into the well of the bowl with the dry ingredients, then stir a few times in the same direction until just combined. Pour the pudding-cake batter into a greased mini loaf tin. Bake in the oven for 35 - 40 minutes or until the crust is a deep golden brown. Cut into thick slices with a serrated bread knife and serve while it's still super-warm for a hot gooey experience. gooey blueberry honey yoghurt pudding-cake. Mmmmm gooey! Looks very successful for a "thrown together" one! I was swooning a little from the gooeyness inside, love cakes like that. It's impressive you can just throw things together and get such an amazing result! I went blueberry picking this week. I like them by the handful and I plan to make some ice cream too. 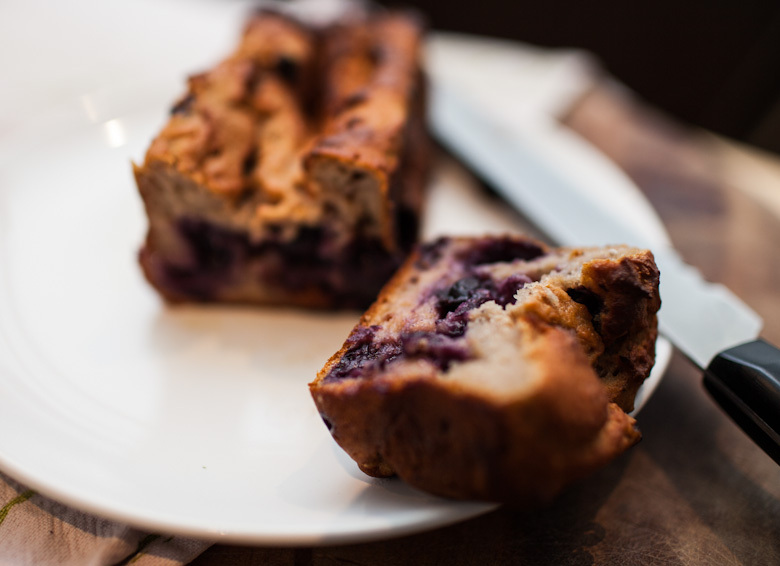 Next on my list : this gooey breakfast bread! P.S. Love your blog! 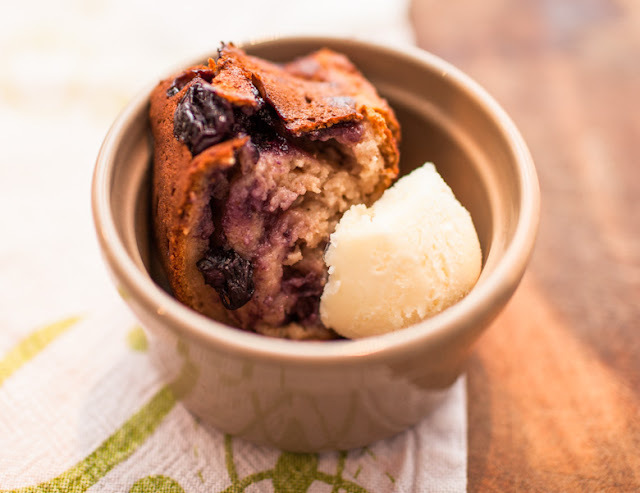 This blueberry cake makes a simple and delicious sunday breakfast. My son and I enjoyed it a lot. The honey and the yogourt both complement the blueberries nicely. Nice recipe, Leaf! That looks like a pretty impressive experiment! I love the combo of blueberries and honey. Thanks! Blueberries and honey do go great together, I agree. DSLRs do take a few goes at getting the knack of them, but they're brilliant. These photos are lovely, I love soft focus photography I think it suits food photography really well. I find that fiddling with f stop numbers and manually focusing when using my 50mm lens really helps gain control with this style of photography. This cake looks incredible, it sounds a little bit like malt loaf! Yep, I've never really gotten into DSLRs, despite having easy access to trying them out via Simon, so it's quite the learning curve. Don't know if it'll become a regular thing, but we'll see! I have heard alot about honey cakes but haven't made one myself but now i want to coz this cake looks sooooo soft and moist! Thank you! Yes, this recipe makes a really soft and moist cake! I would so like to go blueberry picking. Yes to stocking them up in the freezer, too. Wow.. to me anyone who bakes is amazing.. who cares about the crust! YOU BAKED! Okay.. wait.. I lie.. I do like crispy crusts! So I'm happy to go wrong with it just to crisp it up! Gosh. I remember you tweeted about about this and I was like "Um, YES PLEASE!" LOL Yoghurt makes a great addition to cake - it ensures its moistness. This was very moist, indeed! I love puddings that are chewy on the out and gooey within... I love how you discovered this while experimenting to, you have inspired me to start experimenting too! Oh gorgeous. Just gorgeous. Blueberries and yogurt are my standard breakfast, drizzled with honey of course. Imagine in a cake. Maybe slathered with a bit of butter. Perfection! Oh, butter would be decadent! Oh my... how delightful and I do get a distinctive gooey feel from it (owing to the drop in the center I think - love that!). They look so scrumptious! Thank you. Why on earth have I been missing your BEAUTIFUL posts. OMG, this looks absolutely like my cup of tea.